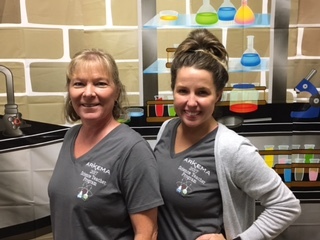 R.J. Vial Elementary teachers Chelsea LaFont and Donna Reyes participated in Arkema’s science teachers program at the chemical plant in Hahnville. As part of this summer’s program, the teachers were mentored by engineers, toured the facility and learned about the many science careers it takes to run Arkema. They received science materials and were awarded a $500 grant to purchase additional science materials this school year. The program is for teachers in grades 3, 4, 5 or 6. The goal is to bring Arkema scientists and local teachers together to spark an interest in science among elementary school students. Additionally, the program aims to make teachers more experts when teaching science. Since 1996, the program has benefited hundreds of teachers and thousands of students across the United States. Funded by the Arkema foundation, the program is run in communities in which Arkema has manufacturing operations. The majority of students who benefit from the program come from socioeconomically disadvantaged homes. Arkema’s program is generally an intensive week-long session for elementary and secondary school teachers. Armed with innovative science experiment kits and the guidance of chemical engineers and scientists, teachers learn new and fascinating ways to illustrate scientific concepts. Scientific topics explored include life, earth and physical science and technology. Teachers work side-by-side with Arkema research scientists in a variety of hands-on experiments. All kits used in the program meet national science education standards. The kits provide each teacher with eight weeks of science curriculum. Participating teachers also receive a donation to purchase additional science experiment supplies for their classrooms and the mentoring guidance of Arkema research scientists throughout the school year. Teachers also have the opportunity to tour the Arkema research center or local manufacturing facilities to learn more about the ever changing, challenging field of chemicals and polymers research and manufacturing.